The proposed new agreement is more than rebranding, but getting to it was an unnecessary crisis. Sorry, but I couldn’t resist riffing off the name President Donald Trump is using for the new NAFTA, which was reached at the last minute to include Canada. Trump concluded a deal with Mexico in August. I and others had suggested that Trump make some changes to the 25-year-old agreement, rename it and declare victory. My favorite moniker was TRUMPTA (in gold letters). But no, it will be the United States-Mexico-Canada-Agreement (USMCA). 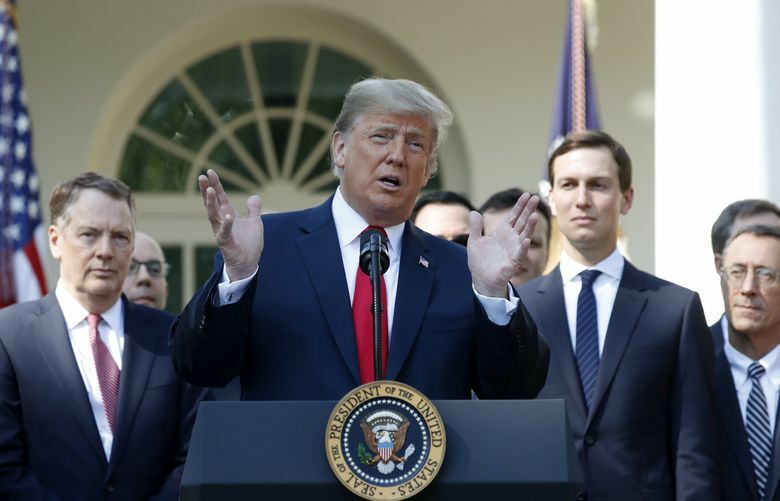 The president says his get-tough approach to trade, including his use of tariffs, was bringing results. Washington state dairy and wine-industry officials, meanwhile, were optimistic about the deal’s effects. Canada and Mexico were Washington’s second- and eighth-largest export destinations last year. They accounted for $7.7 billion and $2 billion in merchandise exports, respectively. The state’s total merchandise exports in 2017 were $76.4 billion. The agreement must be approved by Congress. Actually, it was the vision of Republican icon Ronald Reagan and pushed to the finish line by Republican President George H.W. Bush, although it went into effect under Democratic President Bill Clinton. NAFTA was a bipartisan endeavor. That doesn’t appear to be true based on the information we have, although the new deal does have some substantive changes. For example, it requires automakers to assemble more of their vehicles with parts made in North America and states that at least 40 percent be made by workers making at least $16 an hour. In theory that would benefit American manufacturing jobs, although it would increase costs to customers. But, critically, it would keep the NAFTA supply chains largely intact. It would retain the cross-border agricultural trade, too. Canada agreed to remove a dairy quota and pricing system that had been a source of contention. The new NAFTA is also said to strengthen intellectual property protections, including for tech and drug companies. Amazon and Microsoft were among the technology companies lobbying for advantage — or to limit damage — from the administration’s negotiations. Here the changes look suspiciously recycled from the Trans-Pacific Partnership, the “high-standard” agreement from the Obama administration that Trump scuttled. The biggest winner: Big Pharma. Why? Patent monopoly holders’ gains would raise the value of the dollar, making American manufactured goods less competitive. Another change is a sunset clause, where the agreement would lapse after 16 years if it isn’t actively negotiated. Mostly, NAFTA is intact. And a good thing, too, because Trump’s threatened withdrawal from the North American trading bloc would have been disastrous, not least for American companies and workers. No. Too many economic interests — American interests, too — were at stake to allow NAFTA to fail. He’s fooling himself if he believes the same strong-arm tactics will work against China. They threaten to make Beijing more self-reliant. The months of uncertainty over NAFTA were a self-inflicted crisis by the Trump administration. Donald Trump lost the popular vote by 2.9 million, the election being decided by 80,000 votes in three states. He hardly enjoyed a mandate to dismantle the American-led liberal trading system or to alienate allies. But he took it. He’ll take more.